Rhys Priestland was a key player for Wales when they reached the semi-final of the 2011 Rugby World Cup. Scarlets fly-half Rhys Priestland could benefit from a move out of Welsh rugby, according to former Wales international Arwel Thomas. Priestland, 27, has been linked with a switch to Bath and is in "weekly" talks with Scarlets over his future. 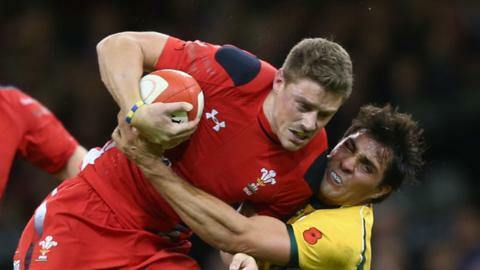 Thomas, who played 23 times for Wales, says a move could help Priestland regain his form. "If he goes it's going to be a loss to Welsh rugby but maybe it will be good for him, who knows?" said Thomas. "I played in England and I played in France and it's just a great experience." Priestland, who has 32 Wales caps, signed a contract extension with Scarlets in February, though it is believed that was a short-term deal which expires at the end of this season. Arwel Thomas (left) celebrates scoring for Wales against Canada in 1997. His potential availability is said to have alerted a number of English clubs, and Scarlets head coach Wayne Pivac admits it could be a struggle to keep the 2012 Grand Slam winner. Priestland was first choice for Wales at the 2011 World Cup and during the 2012 Six Nations, but Ospreys stand-off Dan Biggar has been preferred since the Scarlet missed this summer's tour of South Africa because of injury. Former Swansea star Thomas, who also played for Pau and Harlequins during his career, believes Priestland still has a lot to offer, though understands from personal experience the pressure which comes from wearing the Wales number 10 shirt. "I think Rhys Priestland's a great player, he's a confidence player and he just needs to get some good games under his belt," he added. "He's been under the spotlight a little bit and people looking at every little move he makes and sometimes when you're playing in Wales it's not easy to build up some momentum and just go along about your things quite calmly and slowly. "If he goes to a good club and picks up a good contract and is playing for a good team then it's a great experience and he'll come back a better player."